periods of time I don’t want to forget, or just mundane moments from my life. Even if the picture doesn’t turn out perfectly, I think that just the attention and care put into that moment, that event, that item, imbues it with a certain honor that says, “I was here and this was important enough to me to try to record it.” A picture truly is worth a thousand words. 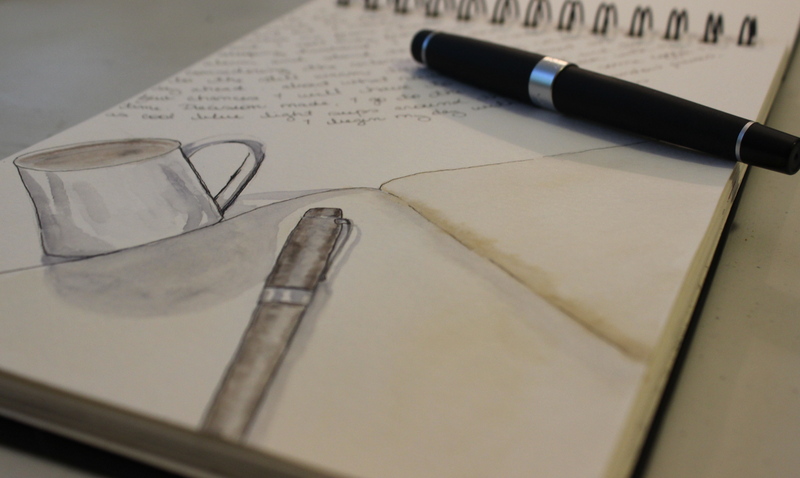 So, I’m excited to have the chance to share my fairly simple watercolor journaling techniques with all of you in the Birmingham area with in an upcoming workshop. NEXT Saturday, March 19 from 9-2 I’ll be teaching a workshop at Samford Academy of the Arts. The cost is $175 plus supplies (my supplies are fairly minimal- a watercolor notebook, a travel watercolor set, a permanent marker, and a water pen are the only items you may not already have laying around). Follow this link: Samford Academy of the Arts , click on the painting tab, then scroll down to my workshop “This is Your Life Watercolor Journaling Workshop” to register. The day did not look promising. Mother’s Day Out (along with all other schools) had been needlessly cancelled due to the threat of “inclement weather,” which in the end, presented itself only in dreary rain. I had a to-do list a mile-and-a-half long, restless energy, and a two-year-old who wouldn’t even let me check my email without destroying things in a bid for my attention. Frustrated and focused on “not wasting the day,” I buzzed around her, attempting to check items off my list, snapping and sighing in annoyance. And then little arms wrapped themselves around my legs. And then a little voice said, “Mommy, can you hold me?” And then I got smart and stopped wasting my day. Instead we snuggled up on the couch and watched a movie. We made a dozen marker drawings.We used up all her finger paints and created a mural on the wall of the bathtub. Then we rinsed it away and used up some fancy bath gels I was saving for a rainy day (What better opportunity?) and splashed around in the foam. And the wasted day became a success. In our house October is scary movie month. Almost every night for the entire month (after the little one has retired, of course) my husband and I watch a scary movie, or at least a scary t.v. show. We run the gamut from campy silly to scary horror. 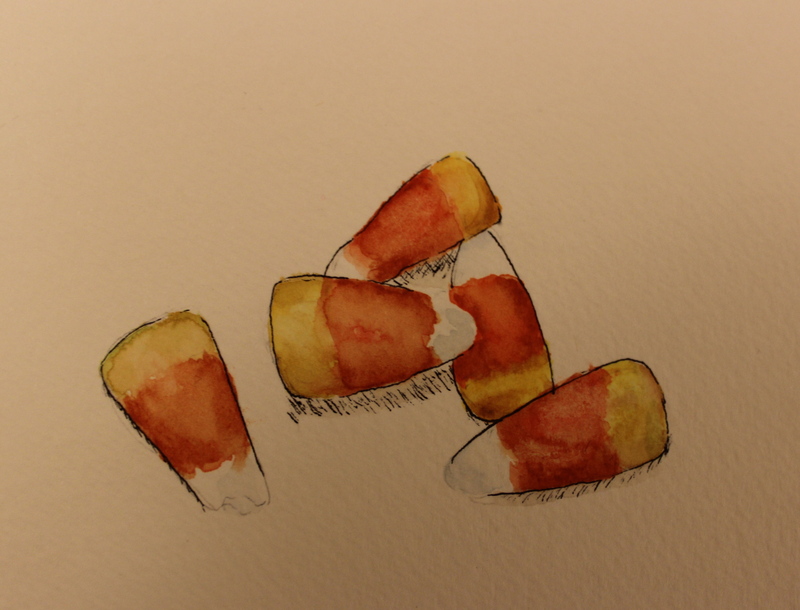 I know this is an art blog and way off subject, but I thought you might want to put down the paintbrush and grab some candy corn and join me. Here’s what we’ve watched so far and my rating, in case you’re interested. Ratings are shown with * on a 5 point scale (I hardly ever give anything 5 stars, so 4 is really good). By the way, who decided this looked like corn? As for scary t.v. shows, we’ve been watching an anime cartoon called, Blood. We haven’t watched much of it, so I can’t rate it, but I like it so far.